Are You Amazing At What You Do?… Of Course, You Are! Do You Want To Be The “Go To” Business In Your Area? The Destination Brand In Your Market Niche? Whether you’re looking for brand new customers or to attract existing customers to a new service, the first thing all businesses need to do is to make it super easy for prospects to find us! So, how do we help you get found? Well, as much as we’d like to imagine that prospective customers are thinking about and searching for our type of business every day – let’s be honest that’s unlikely! What they’re more likely to be doing is catching up with the news of friends and family on Facebook. The UK now has 33 million Facebook users who spend on average 40 minutes a day on Facebook, so it’s no wonder Facebook has become the biggest social media platform on the planet. However, it’s called SOCIAL media for a reason, people just aren’t on Facebook for the heavy sell! The secret to success with Facebook Marketing is to Solve in the first instance not sell. Solve the needs and wants of your prospective clients first, build trust and then gain the permission to share your occasional promotions. Facebook Marketing done correctly will create fans who will supercharge your word of mouth marketing long after your Ad campaign has finished. 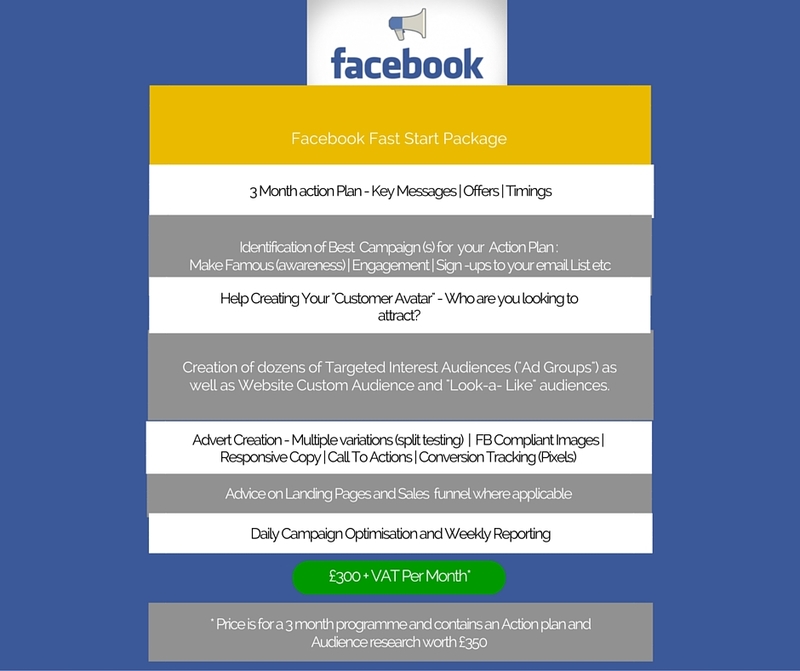 So to help you get started, we’ve created a Special Fast Start Marketing package that will get you on your Facebook journey to Advertising success. If you have some questions then please use the Call Back button below and we’ll call you back for an NO OBLIGATION telephone consultation.